The quality of prints from your HP 9130 printer is great, but have you checked your ink levels recently? At some time your HP 9130 will run out of printer ink, and then you'll soon find that fresh HP 9130 ink may be costly. However, you have no reason to be anxious about paying the high asking prices you'll get on the high street because here at Cartridge Save you can pick up all the HP 9130 cartridges you'll ever want at super competitive prices. Save money on your ink by buying with Cartridge Save! Don't throw away your cash buying the 9130 original cartridge or 9130 compatible ink on the main street when it is far more easy to save money shopping online with Cartridge Save. You can have perfect confidence by ordering your OfficeJet 9130 ink cartridges from us seeing as each one is guaranteed by a no quibbles money back guarantee. Don't forget to take into consideration that each and every purchase also has free delivery, generally arriving next day! A versatile AIO printer that uses HP's signature thermal inkjet technology, the HP Officejet 9130 makes an ideal addition to any office setting. It offers fast printing capabilities plus the versatility of a copier, fax machine, and scanner. The HP Officejet 9130 can also be used over a local network and has stand-alone features, which allow users to operate the machine separate from a computer. Consumables are expensive, though. The HP Officejet 9130 is a much bigger machine that its predecessors. It measures 23x19x19 inches and weighs a whopping 53.1 pounds, which means it requires its own space in the office. 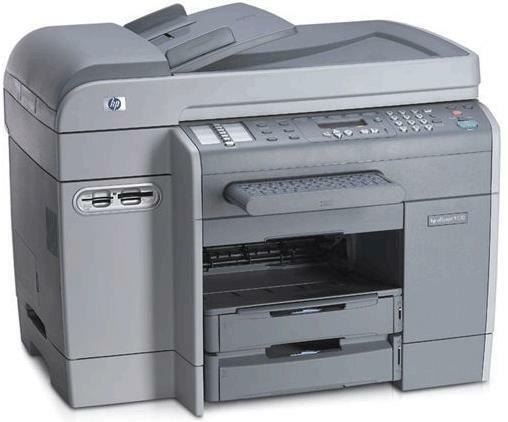 The HP Officejet 9130 features an auto duplexer, ADF unit, scanner/copier, and a fax component, which offers a long list of advanced features, including polling and automatic forwarding. The machine is also designed for heavy duty print work, with a monthly duty cycle of up to 10,000 pages. The office-oriented HP Officejet 9130 can produce colour prints with resolutions up to 4800x1200 dpi, while monochrome prints reach 1200x600 dpi. It supports a wide range of media types, and uses separate ink cartridges for each colour, which means lesser ink waste. The minimum paper capacity for the machine is already substantial at 400 sheets, but this can be expanded to the maximum capacity of 650 pages. The HP Officejet 9130 does not have many disadvantages. Users are generally pleased wit its performance. However, consumables can be costly in the long run.